I know I haven’t been too forthcoming with details on the last book in the Soulstealer Trilogy. I am the worst with secrets and it’s been particularly hard not to reveal the way the plot twists in the end. In fact I have been keeping so much locked up tight that I actually changed the ending today from what I thought it was going to be. Of course I am only in the first draft, so that could all change. I had originally hoped that the book would be ready mid summer, but it looks like it will end up being a fall release. This is partly due to the state the first draft is currently in, but also because I don’t have the funds to pay my editor. All that should change in the next six months. I’ve been seeing quite a few sales in Canada, New Zealand and Australia. Just wanted to say thank you to all my readers. I’m really glad you’ve come along for the ride. 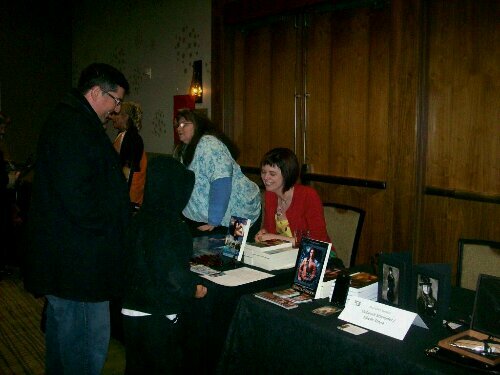 Hey look, that’s me in the red signing books. Can’t wait to hand out new copies of Fae Warrior! This entry was posted in On Writing and tagged Fae Warrior, fantasy, first drafts, indie author, indie writing, Romance, writing. Bookmark the permalink.